Do you often find that, when trying to fall asleep, you just have too much on your mind? This is a common problem among people who struggle with sleeping, with or without a diagnosable sleep disorder. We live in a past-paced, always plugged in culture, which is not always healthy for our sleeping habits. Here are three steps you can take every night to empty your mind and start to get better sleep more regularly. Follow this advice to establish new ways to lower your stress levels and clear the most anxiety inducing thoughts from your head temporarily. One thing you can do to begin to empty your mind after a long day is to establish a regular routine which you practice every night before you go to sleep. Choosing activities that promote relaxation and reduced stress and anxiety is one step, but putting it all together into a set of things you do regularly helps your mind adjust to starting to relax at a certain time of night as you begin to prepare for sleep. There are things you generally should and should not do before you intend to fall asleep at night. Knowing what not to do in the hour or two before you go to sleep is an excellent starting point when establishing a nightly routine. You might have a few bad pre-sleep habits you aren’t even aware of that you need to work on changing, such as using your phone or watching T.V. Gradually stepping away from these mind-cluttering habits is an important part of this first step to a clearer mind at the end of each day. From there, establish regular things you can do to replace possible bad pre-sleep habits, such as reading a book, talking to someone on the phone or listening to music. Some people even benefit from a nightly workout, and you might be one of those people who needs to exert excess energy in order to get a good night’s sleep. It doesn’t hurt to try. If it works for you, make it part of your routine. Our brains have a way of bringing up the most jarring and insomnia inducing thoughts and memories just before we are ready to drift off into dream land. You can try to focus on the positives, but that can be hard when you do not have very much to distract you. If you plan on going to bed soon, and you notice your thoughts seem to be all over the place or you feel anxious, you can try writing down how you are feeling and what you are thinking about as an attempt to have your mind emptied before you are ready to sleep through the night. Don’t just write down a list of things you need to get done tomorrow, though that might help you get your mental to-do list onto paper. Put down things you are worried about, too. Or things that happened to you that day that bothered or puzzled you. You are even free to write down good things that happened to you or good memories you happen to be thinking about. Both good and bad thoughts can distract us enough to keep us awake when we should be sleeping; whatever comes to mind, write it down. The benefit of jotting down your thoughts is that some people might feel physically exhausted after doing so. The concept of emptying your mind becomes much more literal when you can visualize yourself pulling a thought out of your head as you are writing it down in a journal or on a piece of paper (not your phone – no screens before bed, remember?). The physical act of clearing thoughts from your mind might be just what you need in order to fall asleep soundly. It can be difficult to wind down after a very stressful day or week. We often have so many thoughts and worries running through our minds that even the idea of forgetting about them long enough to get some rest seems completely outside the realm of general possibilities. If writing things down in an attempt to empty your mind is not a technique that works for you, you can replace that step with this one, or try them both, this one last, and see if that helps you fall asleep more peacefully at night. 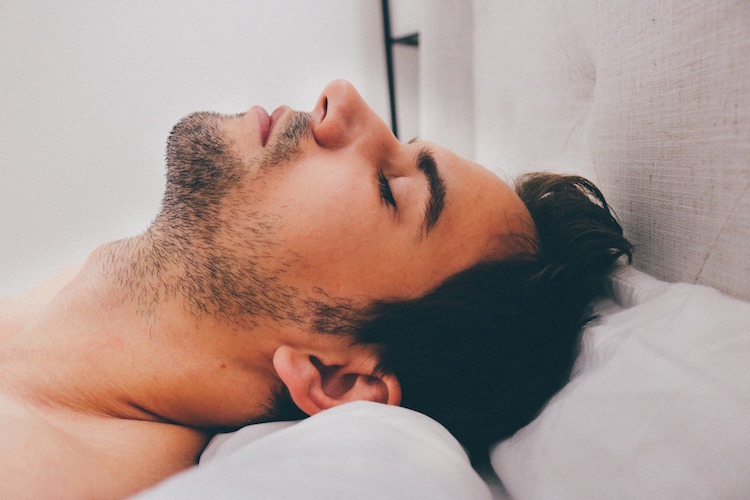 Sometimes clearing our heads before we get ready to fall asleep at night is as quiet and simple as engaging in relaxation techniques. Even if you are generally not too fond of the idea of meditation, this is still worth trying if you have problems clearing your mind when it’s time to fall asleep. These kinds of techniques are meant to push all of the stressful thoughts and negative feelings out of your mind, at least temporarily, so that you can rest peacefully for seven to nine hours, or however many hours of sleep you personally need to feel fully rested. Trying mental relaxation exercises such as meditation exercises before falling asleep can help clear your head and relieve you of the stress and anxiety that might often be keeping you from sleeping enough at night. Meditation can be done anywhere and anytime, but some guided meditations are designed specifically so that you can fall asleep in the middle of them feeling completely exhausted yet relaxed. Try a few beginners’ exercises to see if any of them in particular work for you and help you to clear your head around bedtime. Having trouble clearing your head enough at night to sleep is common, but it is something anyone can learn to deal with if you are willing to take the right steps in order to do so. Empty your mind every night in order to reap the many benefits of getting a good night’s sleep more often than you have in years.